Shypoke eggs, a staple of the Little Hipps restaurant in San Antonio, can be enjoyed at home with this shypoke eggs recipe. Shypoke eggs have been a popular San Antonio appetizer for years. Originating at Little Hipps Bubble Room, run by Loyal D. Hipp, shypoke eggs were one of the menu items that would draw crowds to the now defunct restaurant. Little Hipps servings were not little. Known for their huge burgers and large servings of everything, a large order of fries, called a basket, could feed eight people. One burger, called a hot burger steak, was a mixture of onions, jalapenos, and cheese stuffed between two hamburger patties. Little Hipps Bubble Room closed its doors in 1980. L.D. 's son ran Little Hipps Gimmedraw Room up until 2002, when it also closed. But the Little Hipp legacy continues as several of the staff from Little Hipp's has opened another restaurant called Timbo's. Following in the tradition of Hipp's, Timbo's serves good burgers and, of course, shypoke eggs. Shypoke eggs have been described by some as great and by others as bland. 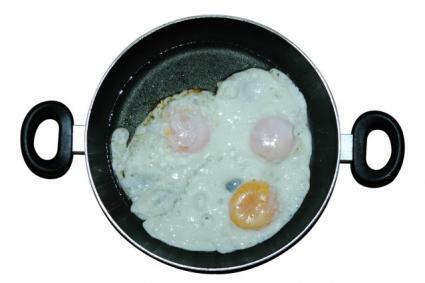 The following is a basic shypoke eggs recipe. Using a 4" cookie cutter, cut the tortillas and Monterey Jack into rounds. Cut the cheddar cheese into rounds. Slice the jalapenos into thin rounds. Heat the oil pan and fry the tortillas until crisp. Place tortillas on a cookie sheet lined with parchment paper and top with Monterey Jack and a slice or two of pepper. Top that with cheddar in the center. Bake in a 350 degree Fahrenheit oven until the cheese is melted. I tried this recipe with both corn tortillas and flour tortillas and I found that although I had better results with the flour tortillas, I have always preferred flour tortillas to corn tortillas. Making this shypoke eggs recipe, I decided that, yes, it is indeed bland. The peppers added some kick and, with some hot sauce slathered on top, gave it some more flavor but still it was missing something. I decided to go one step further and make them Huevos Rancheros style. In a 12-inch cast iron pan, sweat the garlic and onions until the onions are translucent. Add the jalapeno peppers and sauté until they begin to soften. Add the beans and about 2 cups of cooking liquid. Bring to a boil, reduce to a simmer, and let simmer for an hour and a half to two hours, adding beer as needed to keep the beans moist. If needed, add more cooking liquid reserved from the beans. Hold off on adding salt until the beans are almost done. In a food processor, puree 3/4 of the tomatoes in all the juice from the can. Add the rest of the ingredients and puree. Pour the puree into a saucepan and add the reserved tomatoes. Simmer over a medium heat until it thickens. Once you have all the components together, put some refried beans on the plate with the shypoke eggs. Top them with the salsa you just made. This arrangement was quite tasty and it was fun to pick up the "egg" and use it to scoop up the beans.